Another person with the last name of Bakiev joined the government in Kyrgyzstan. Last week Maxim Bakiev, the youngest son of Kyrgyz President was appointed as the head of Central Agency for Development, Investment and Innovation (CADII). Now it seems like Maxim Bakiev is going to immediately prove his consistency as the new independent political figure. On September 1, 2009 President Kurmanbek Bakiev proclaimed the state administration reforms and the establishment of CADII, immediately headed by Maxim Bakiev. Major points of CADII program: the loans to agricultural sector, development of leasing, affordable housing, regulation of agricultural sector through "the orders" of future crops and further export. Earlier this week CADII managers attended the press-conference where they shared about the plan of the agency. Maxim Bakiev attracted young government employees to CADII. The experts name them as future ministers and highly ranked executives: Azamat Dikambaev, Uchkun Karimov, Kanat Asangulov and Alexei Eliseev. They are young and competent: only one deputy Head of CADII is over 40 years old. The successor or the accumulation of capital? The appointment of president’s son to such high position produced wide public discussion, especially among those who believe that Maxim Bakiev will become the successor of current President. No doubt, in Asia the children of other presidents also took over important deputy positions in the ministries and agencies. Maxim Bakiev is a different story. He became the real Head of very influential and powerful structure in the system of state management. Unofficially, the new appointment of Maxim Bakiev was widely discussed throughout the republic. The local mass media paid great deal of attention to this event; however, they gave only positive or at least neutral comments. TV news showed video with the dwellers of Bishkek where they referred to Maxim Bakiev as successful businessman with international experienced and wished him good luck. Kyrgyz Development Fund is the trust manager of all state companies in the country. This organization manages funds, received for the construction of strategic Kambarata hydropower plants in the river of Naryn. Besides, using foreign funds, the Development Fund will issue loans to the government. 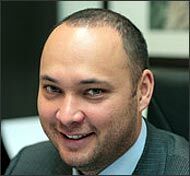 Alexei Eliseev, current deputy of Maxim Bakiev, became the General Director of Kyrgyz Development Fund that is now the component of CADII. Obviously, the plan to involve Maxim Bakiev in big politics was prepared at least three years ago. After the death of Medet Sadyrkulov (allegedly, he was close to Maxim Bakiev) the position of "reformers" group weakened. "Tradionalist" group, headed by president’s brother Janybek Bakiev and supported by all southern politicians, gained stronger positions. Nevertheless, it turned out to be temporary event and the current situation is very different. The events of 2005 proved the Kyrgyz society is not used to vertical transition of power and it is very zealous about "family rule" in the county. Besides, the Kyrgyz society is ready to mobilize forces against clan rule in the top administration. The Bakiev family hit two targets: it involves Maxim Bakiev in politics and turns it to the manager that concentrates significant resources. The parliament, controlled by president’s Ak-Jol party, creates necessary legal basis. On the other hand, it has to be underlined that majority party, supporting Kurmanbek Bakiev, is not able to control CADII, directly subordinate to the president.